Barko forwarders implement technology exactly (and only) where it’s needed, thus simplifying machine design and serviceability while delivering consistent production capabilities. 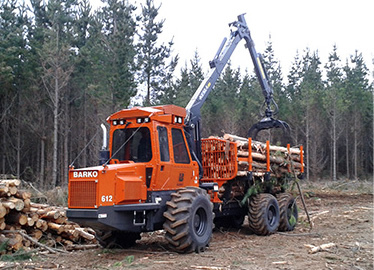 Equipped with intuitive controls for smooth operation, Barko forwarders provide ample load capacity in combination with excellent stability and maneuverability. The Barko 612 forwarder offers a full 20-inch ground clearance and provides excellent weight distribution for steep grades. Low operating weight keeps ground pressure low to minimize ground disturbance, while access panels contribute to easy servicing.